Being less than impressed by my visit to this festival last year it is surprising I find myself here once more. I blame my sister. She wanted to go this year. Since it is a beer event (loosely) and I am slightly attempting to keep tabs on these things in Kingman, and it seems decent to preserve consanguineous relations, well, here I am. The weather is decidedly worse this year. Heavy gray clouds are threatening to bring forth a downpour of some kind of precipitation. The temperature is too low. At least it’s not raining yet. It’s about a quarter to five and so far there are approximately twenty people here. My sister and I just missed the polka band. Good or bad? One big improvement his year is: I made it in time for the good beer. Beck’s Octoberfest and Mudshark’s Oktoberfest is not sold out yet. 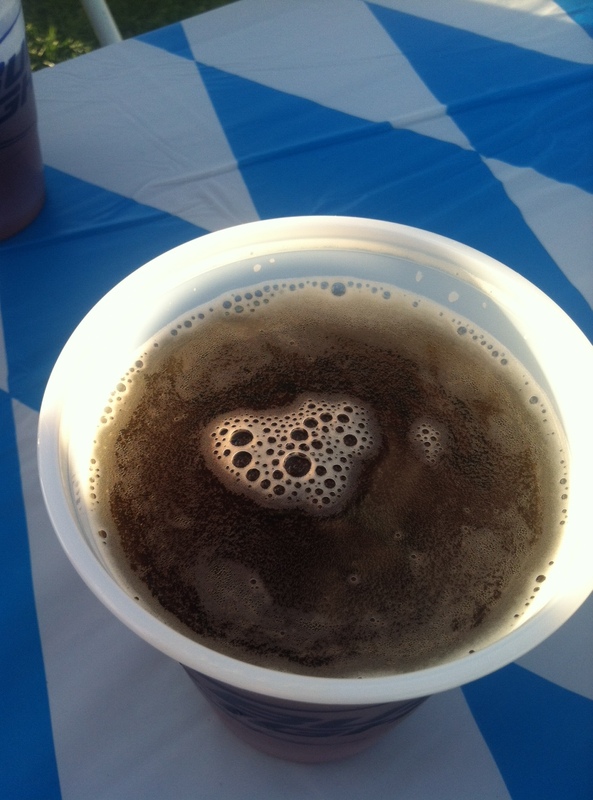 Of course, I did not realize that Mudshark had a presence at the Octoberfest until I’d ordered a Beck’s. Ah,well; I’ve got cash for more beer. The Beck’s had a good head. It was orangey in color. It was a little thin. However, it was better than other choices. Bud Light, Budweiser, Shocktop Pumpkin. But Mudshark’s Oktoberfest was the best. Who’s shocked? Really? I chose a seat in the sun to try to keep warm but the downside is that it was near the road, The aroma of the Mudshark beer was masked by exhaust. How lovely. But the taste was present. Bread, caramel, cigarette smoke – what the? Stupid smokers. It’s more brown than I expected. But, I am looking at it through a mildly opaque plastic cup. Still, it was enjoyable. Two cups worth. What else happened? Well, I learned that Budweiser has a presence in Fort Collins, Colorado. I can’t say I was thoroughly happy with that. My sister visited the brewery when she lived in Loveland. I realized that I hate that there are some nice locations in this town and they are ruined by various things: trains, people. That’s right, Locomotive Park downtown isn’t bad, just not utilized right. The cursed train rolled through at least three times. The event is still boring. I mean, the beer was decent this time. But there was too much downtime. We waited way too long for the next band to setup with nothing to do but listen to pre-recorded Bryan Adams and watch some people make googly eyes at each other – and they weren’t young enough for it to be cute. Neither activity was exciting. Two hours in, maybe forty people have arrived. The googly eye couples, as noted, some older people (rotary club members?) and a couple of groups of young people who seemed to be enjoying their socializing. The event organizers expected four grand in total attendance. Wonder if it will happen? There was a big police presence; didn’t notice them last year. Makes me wonder if something happened last time around. My sister had a good time because she was introduced to Mudshark. and got to talk. Those young people seemed to have a good time. This thing might be better if you had more friends with you. Kingman’s Oktoberfest wasn’t the total waste of time it was last year, but it still needs more beer. Much, much more beer. Cleanse yourself of every defilement of flesh and spirit I have read. Thus, I sit here with my last Samuel Adams Octoberfest gently rinsing away the icky from a paltry, so-called beer festival/Octoberfest I hath just attended. 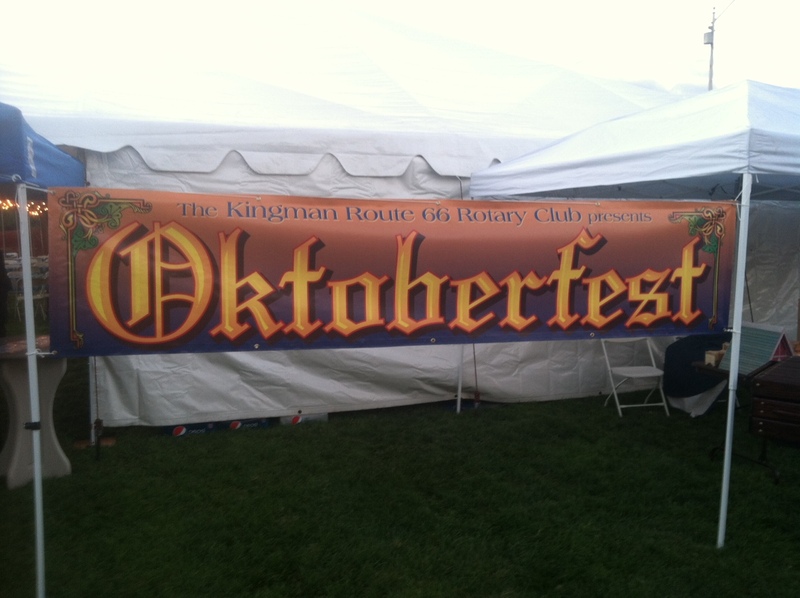 Kingman‘s “Oktoberfest” is now in its fourth year. It’s been held in downtown Kingman at Locomotive Park right across from the Powerhouse. I did not attend the first three because I knew this was Kingman and had a faint idea of what a beer festival in its infancy here would be like. For some reason, a streak of optimism and unfounded hope shot through my brain yesterday and I decided I’d try it this year. After all, I am a novice beer writer, eh? I’m trying to research and delve into the world of beer, right? It’s sort of my responsibility to keep abreast of beer functions and beer culture in my town. Thus and so I arrived, with an old friend in tow. There was no organization apparent. There was one traffic sign that indicated there was a “special event” ahead and that was it. No signs, no directions as to where to park. We discerned, though, that we needed to park at the Powerhouse. The park was, as noted, across the street. Being in traffic in Kingman, be it vehicular or pedestrian, is taking your life in your own hands. But, we managed to cross the street. The first thing I noticed was that there was no energy in the air at all. No excitement. There were a few other tents/booths set up for people to hawk their wares – rugs, decals, tattoos, other junk – all facing the inside of the park. There was nothing along the road, nothing facing out, nothing inviting people to stop and check out the event. I was utterly disappointed. 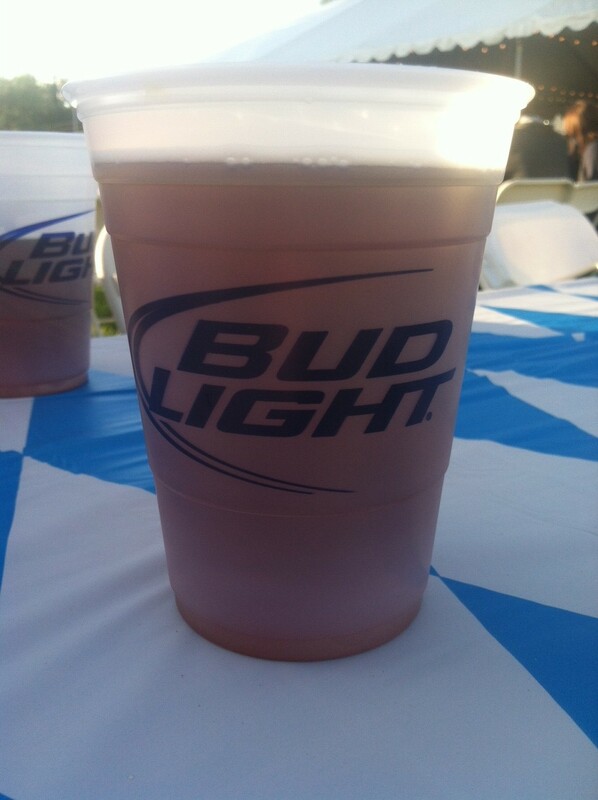 As I continued moving on towards the beer tent, I became appalled. At the entrance to one tent I did meet one person I knew; we shook hands and chatted for a moment. He gave me some guidance as to how to proceed into the venue. I’m glad he was there or else I’d have had no idea where to start or where the beer was. That’s right, it’s a beer and brats Oktoberfest and you couldn’t find the beer serving spot without help and couldn’t smell even one brat cooking. No one else really spoke to us at all; they were busy focusing on, I don’t know, themselves. The one good thing I can say about the whole experience is: it was free to get in. Things went downhill after that. Downhill after free? Indeed. Really? German beer? Oh, they must have meant Beck’s. It cost $4.00 for a twelve ounce cup. I buy a couple and wait. And discovered that the classic customer service attitude of Kingman was on display. What’s that, you say? Kingman has a customer service attitude? Well, by that I mean that the vendors and servers give the customers attitude. There is no sense of service or interest at all. My friend and I stand nearby the beer truck and its quickly erected tables, just standing there, observing, sipping the Beck’s Oktoberfest (the lesser of greater evils), not in anyone’s way at all. In fact, no one was line at the time. The beer serving girl comes out to us and snottily tells us that we need to go one way or another; get out of the way basically. So, like, I just forked out $8 for crappy beer from this woman and she can’t even be civil. She has no idea how to deal with the public. I go back to the pretzel table and it still isn’t ready. It’ll be another twenty minutes. Fine. Me and my friend weave our way through the closely placed, cheap plastic tables and chairs and around all the little cliques and find some seats to wait. There’s a band playing. They’re okay, not great, but not terrible; don’t know if they were from Kingman or not. And they weren’t playing country. Oh, look, I found a second good thing to say. We sit for a while and I go to get my pretzel. It’ll be another five minutes. Meanwhile, during the last seven minutes of waiting about three other people around me get pretzels. Then, the girl who initially took my ticket, then discovered there were no pretzels and had to dig my ticket back out of the big ticket jug, gets a little huffy when I show back up to get the pretzel she told me to come back for. “Oh, I already took their tickets, I’ll get to you when they’re done,” she tells me and starts serving others. Finally, though, I get my pretzel. 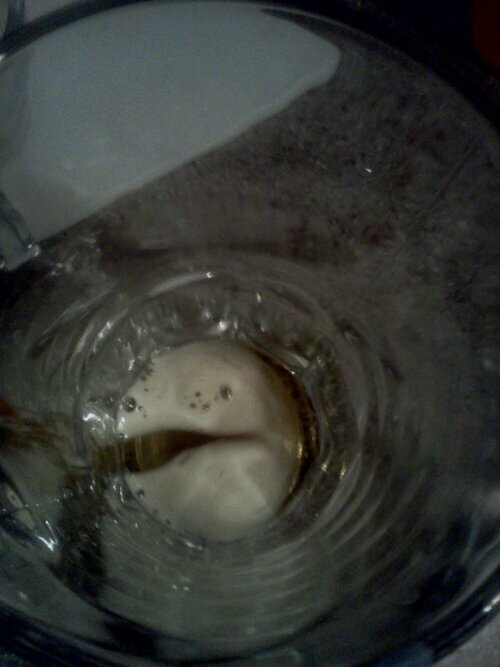 My beer is gone. It wasn’t worth buying another one. We’re downtown near the train tracks. So, after the band is done with their set a man whom I will assume is one of the organizers of this event begins bellowing out trivia questions via an underpowered public address system the train was roaring away behind us, sort of, you know, drowning him out. Go figure. Who would have thought that the train would come through then? Oh, that’s right, it regularly passes through Kingman. Now, listen, I didn’t go there with a bad attitude, expecting bad things. I was actually looking forward to it. I didn’t expect a lot, but I was hoping that maybe Kingman was growing up a little. I wanted it to be a good experience. Instead: snotty vendors, crappy beer and a bunch of old people who get toasted off Bud Light and decide to dance with each other in between closely placed tables to blues music that was okay, but not great. And in Kingman fashion, everyone showed up with other crackheads that they know so they sat about in their little cliques, no milling about, no socializing. It was a giant, open air, overpriced Kingman bar with the accompanying social outcasts and idiots and their cigarettes. Oh, and they brought their kids. Small kids, six and seven and eight. There is no beer culture here. Well, I take that back. There was no beer culture there. No culture at all, in fact. It was full of dull, crass, unsophisticated Kingmanites. It is worth noting, however, that Mudshark’s beer was the first to sell out. There are those here who can recognize good beer. I’m sure all twelve of them showed up before me and my friend and quickly emptied the keg of good stuff. I may very well organize my own. If any out there are with me, let me know.